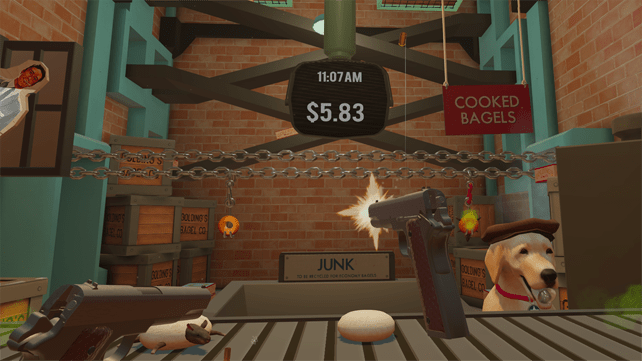 There’s a trend emerging in VR titles – shooters. They seem to be rapidly becoming the most common game available on any of the platforms. It makes sense, use two controllers to replicate a weapon in each hand, use the full 360 degree view to immerse the player, and give them something tangible to aim at. With the large number of shooting games arriving on the market, how do you make yours stand out? Character, style and substance is the key. Until Dawn: Rush of Blood managed it by setting the events on a rollercoaster ride, and that’s where Samurai Punk’s take on 1960s Americana begins. There’s a different kind of horror on show in The American Dream though, one that’s more satirical than providing jump scares, and one that will compel you to play until the truly bizarre ending. Imagine a world where the gun rules every component of life (not too hard a stretch for some); where you’re introduced to firearms from birth; where babies are fed with them and cars cleaned with them. Sounds insane doesn’t it? That’s the world you’re visiting in The American Dream, taken on a guided journey through the worship of gunpowder and steel; from cradle to grave. Your companion over the course of the 3 hour tour is a golden retriever called Buddy who’s the biggest gun lobbyist they could find to sell the bizarre religion to you. Taking you step by step through the lifecycle of a young, wholesome American, you’ll experience what it’s like to grow up with your hands wrapped around pistol grips and rifle stocks. Seated in an armchair that guides you from room to room, each representing core moments in growing up, you’re asked to demonstrate marksmanship in a variety of intriguing situations. It’s mostly executing chores with guns, but the way they’re setup is definitely unique. 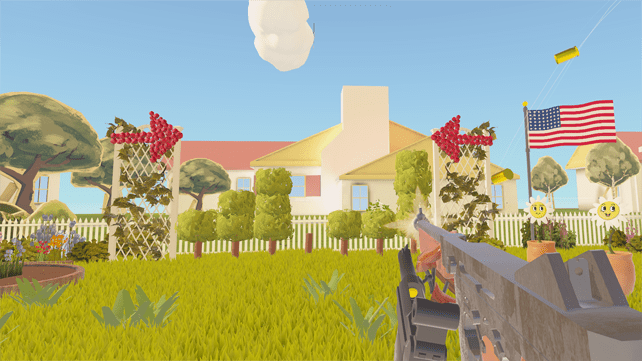 Mowing the lawn, watering the plants, trimming the hedge is not something traditionally done with a mock Thompson machine gun, yet it seems perfectly normal when in the simulation. Weapons of choice are dual pistols that are reloaded through hitting buttons on the arms of the chair that eject magazines into the air in slow motion that you slip your pistol over to continue firing rounds – it feels very slick and never grows old. Other guns are provided at certain points to complete tasks, and each handles very differently giving you something new to learn. The two handed weapons all provide a “hand gun” that’s used to load magazines, stabilise aim or operate a bolt action and it works much better than expected to make you forget that you’re only holding two pieces of plastic in your hands. 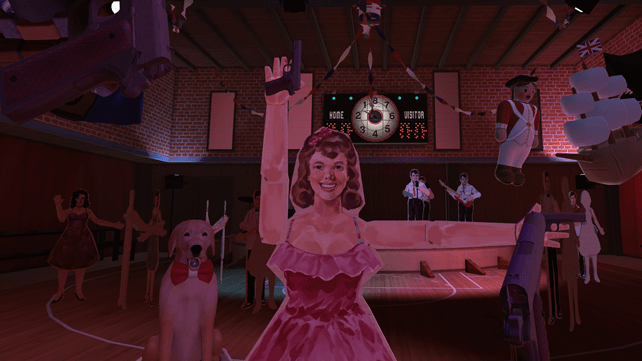 With a 1960s propaganda vibe throughout, the early stages are funny and strangely believable, though it soon starts to take a darker turn and all I’ll say about the last levels is that it jumps the shark. Balsa wood cut outs with speakers embedded represent all the main characters and cement the old school carny ride feel. Secrets are hidden in the levels usually in the form of stars to shoot, though experimenting with what’s interactive and what’s not provides a neat distraction. It’s unfortunately not stable all the way through with a few glitches experienced on the PSVR version. Nothing that a level restart didn’t resolve though. The controller and head tracking is top notch in that you can actually use the sights on the guns without interfering with the headset location, and most of the actions work very smoothly. The only complaint is at a stage where things get more hectic and there are two M16’s in play, the reload is atrocious and failure happens because of the mechanisms of the game rather than your inaccuracy. 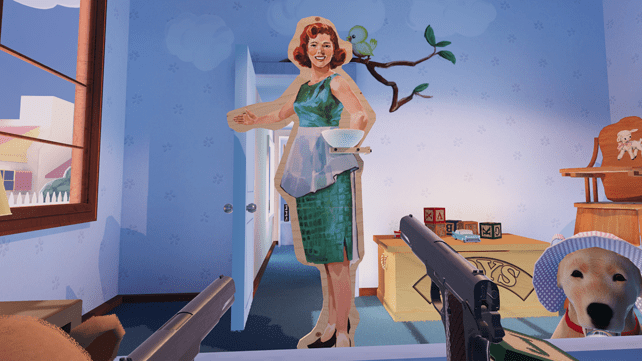 The American Dream provides a very different experience in VR, it’s like a cross between Job Simulator and Shooty Fruity, but doesn’t quite hit the same heights of either of those. It’s an interesting romp parodying the obsessions around gun culture and tries to make commentary on the absurdity of it all. Ultimately though it misses the bullseye with the rapid shift in direction towards the end that doesn’t really sum up the last few hours or fully make its point. Its sense of fun and sharp mechanics are what make it a game that I’d recommend, as long as you’re aware of the rough edges and occasional fired blank. 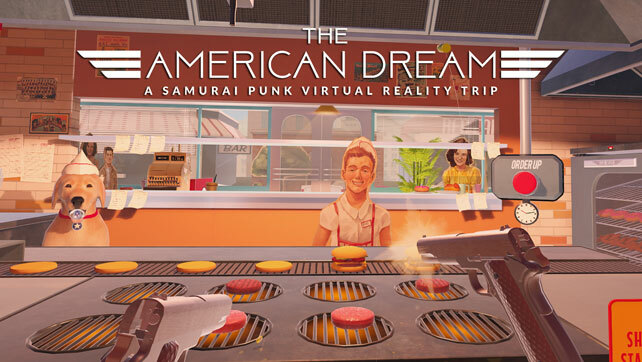 A PSVR copy of The American Dream was provided by Samurai Punks PR team and the game is available now on PlayStation and PC VR units.